The tracks of this CD span traditional Irish dance tunes, original ballads and tunes, a boogie-woogie, even a piece composed for symphony orchestra. Each track is set in its own acoustic space appropriate to its unique voice. If any concept unifies this work, it is artistic expression presented without loyalty to any genera, dogma or expectation. Click on the CD cover below to listen to sample tracks. No obligation to buy. This the most recent CD of my trio - 3 Sheets. 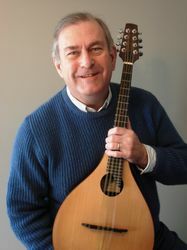 The recording includes traditional and original music. Click on the CD cover below to listen to sample tracks. No obligation to buy. Click Here for purchasing information and to listen to six of the twelve tracks on Spring Tide on the Tump.